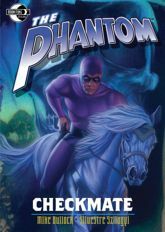 This volume collects the Phantom story "Checkmate", which ran in issues #21-25,Rebels warring in Bangallan jungles, terrorist attacks in the streets of Mawitaan and an old enemy suddenly freed from prison for no logical reason. Is this a series of unrelated events or part of something far more sinister? To the outside world, this man, seemingly immortal, has always worn the mask. As the legend grew, it transcended the life of any one mortal. And that legend became THE PHANTOM! High adventure and intrigue in the African jungle, on the high seas, and in the streets! There is always justice that needs to be served, whether it's in the present�or the past.